Hi there! 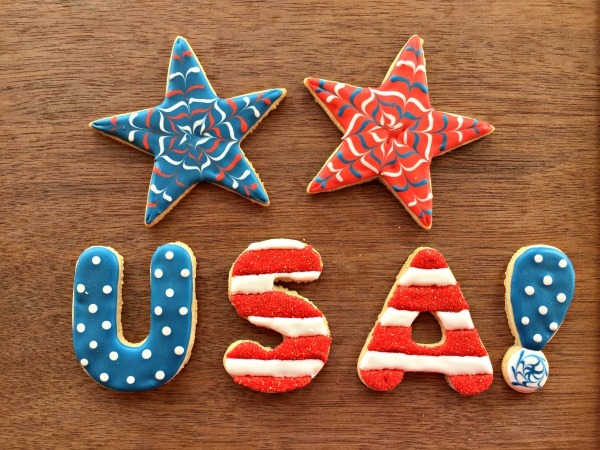 Here is the step-by-step photo tutorial referred to in my YouTube video, below, so that you, too, can make these patriotic cookies for your Fourth of July festivities. 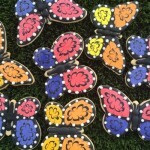 Apologies for the less-than-stellar quality of the photos. I had a few GoPro issues that day….grrrr. 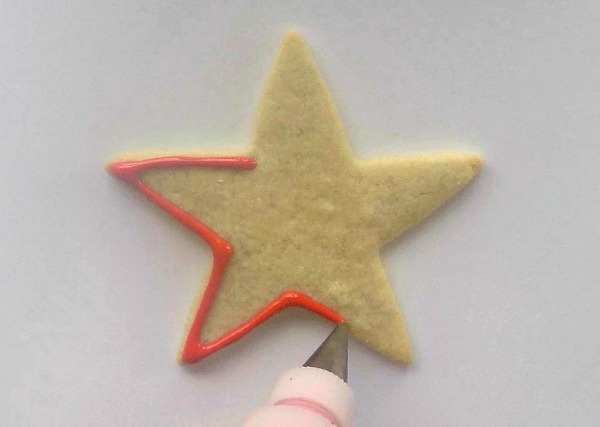 Step 1: Make your favorite sugar cookie dough recipe, such as the one for my Vanilla Orange Sugar Cookies, and cut out star shapes. 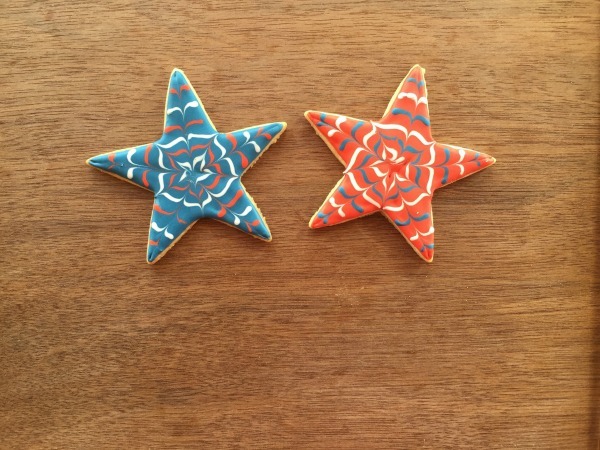 This design will also work with plain circles if you don’t have a star shape. 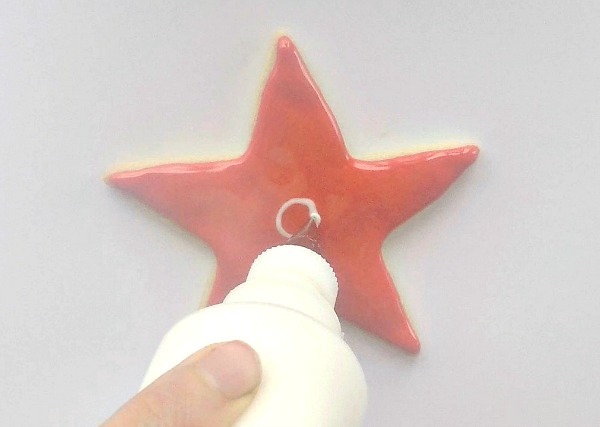 Step 2: Outline the star in red royal icing. 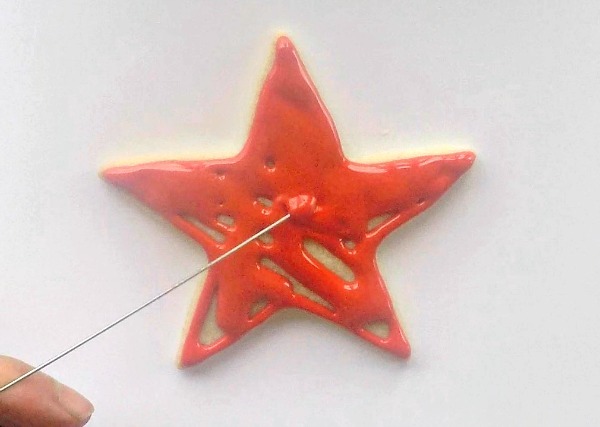 Step 3: Flood the star with red icing. 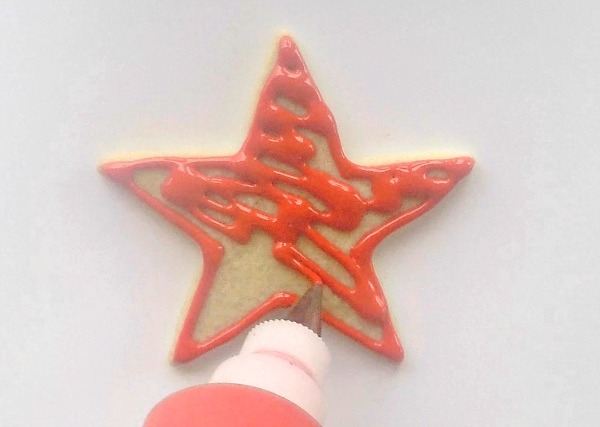 Step 4: Use a cake tester, a stylus or a toothpick to fill in the star and get rid of air bubbles. 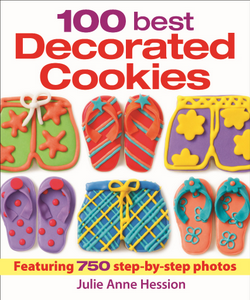 Step 5: Immediately start the circles! 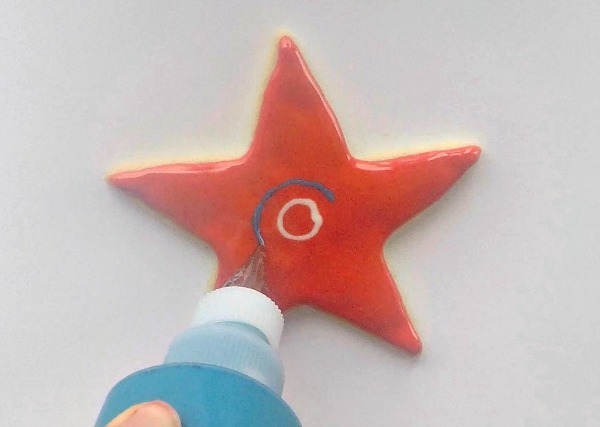 Using white icing and a #1 round tip, pipe a small round circle in the center of your star. 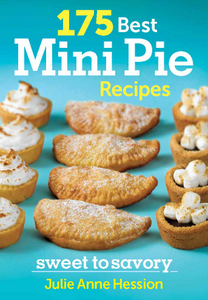 Step 6: Using blue icing and a #1 round tip, pipe a larger blue circle outside of the white circle. 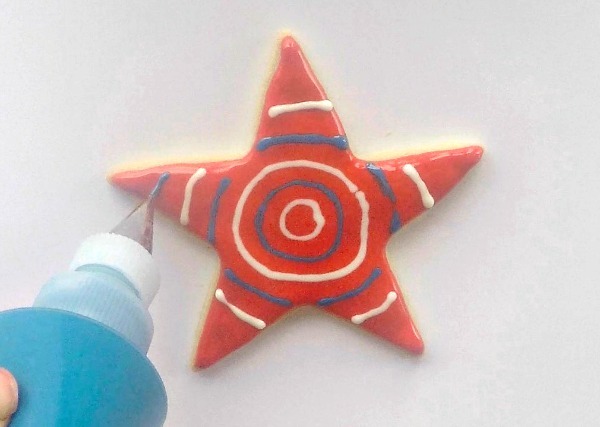 Step 7: Continue to alternate white and blue circles until you get to the edges of the star points. As you can see, you will need to skip from point to point as the circles grow larger. Try to place the lines at the same place on each point. 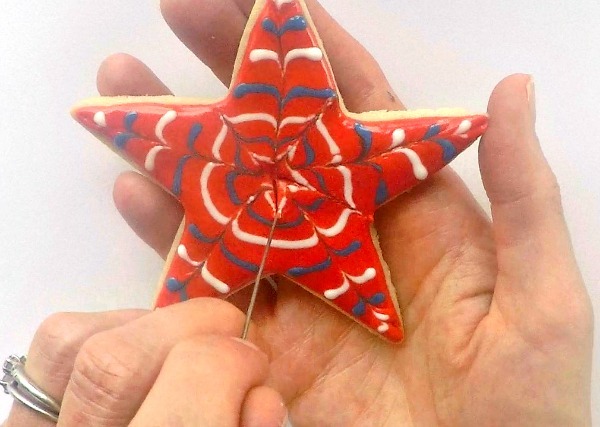 Step 8: Working quickly, immediately use a cake tester or toothpick to quickly draw lines inward to the center of the circle from the five outermost tips of the star’s points. 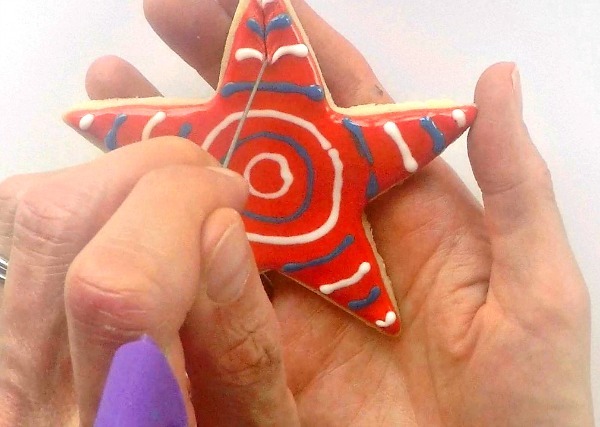 Step 9: Working quickly, immediately use a cake tester or toothpick to quickly draw lines outward from the center of the circle to the five innermost spots that fall between the star’s points. Step 10: Ta-da!! (Cue fireworks) You’re done! 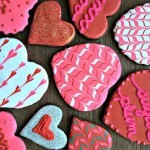 Allow the cookies to dry. 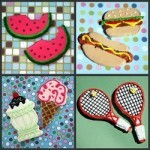 As you can see, above, you can play around with color combinations to make an array of be-yoo-tee-ful stars. LOVED the video. WELL DONE. Just so fun. 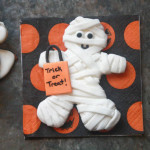 Am going to show it to some of my grands!! Thank you so much, Nancy!! 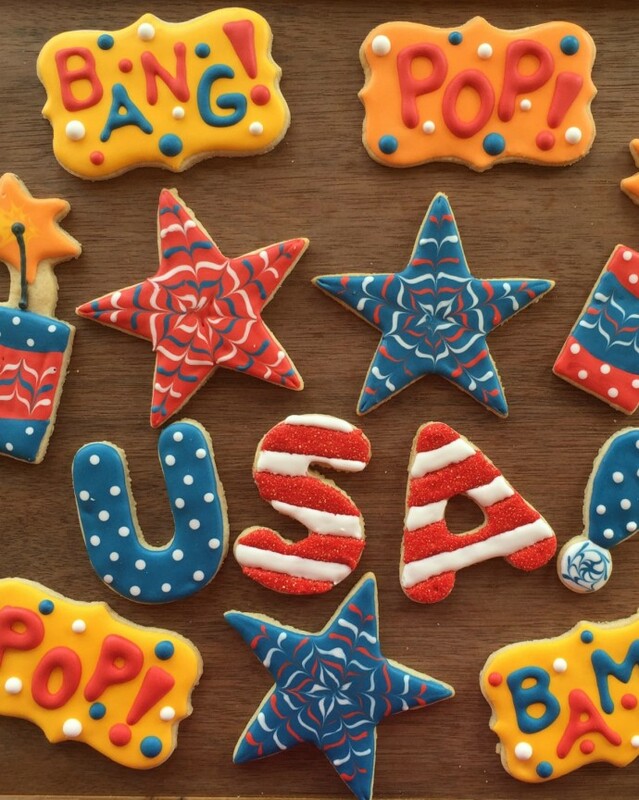 Wishing you and your family a safe and happy 4th of July! !